Cellular microbiology is the bridge between cellular biology and microbiology. 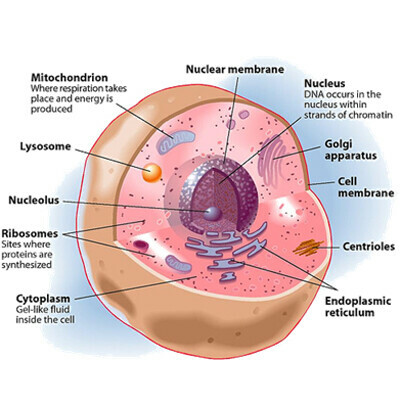 Cellular biology is the study of cells and their physiological properties. In Charles Darwin’s day, it was believed that cells where nothing more than globs of gelatin like substance that had no complexity to its structure. Located in the nucleus of the cell, contains the chromosomes which hold all the genetic information for creating and performing necessary functions. The nucleus is literally more advanced, comparatively, than any supercomputer in the world today. Gradualness is the proposed process, presumed by evolutionists, that over a long period of time small changes within an organism or cell occurs. This presumption assumes that extremely small or ‘gradual’ changes occur within an organism or cell which eventually produces some form of adaptation or evolutionary advancement. Gradualness cannot account for anything that requires simultaneous needs within a complete system. If the nucleus needs energy (i.e. from mitochondria) to function, and the mitochondria could not function without the nucleus, gradualness can not account for the existence of either system due to the incompetence of an incomplete or dysfunctional conformity. Gradualness cannot account for complex structures with a cell, as countless randomized variable non-functioning cellular structures would also have to accommodate every functional cellular structure. This is due to processes of elimination, and non-specific randomized genetic outputs. The mitochondria are responsible for creating the fuel necessary for cells to survive, which is found in all eukaryotic (multi-celled) organisms. A Biochemist of the university college of London, Nick Lane, reported that any eukaryotic cell requires a fully functional mitochondrion to already be in place. A complex system composed of well matched interacting parts that contribute to a specific function, wherein the removal of any one of the parts causes the system to become less effective or cease functioning. Applying this to any portion of an evolutionary process would immediately make the theory fall apart, especially when considering how genetics work. For many whom do not understand how complex structures work, they simply state that even though simple structure cannot fall together through random change, extremely complex structures origins have a highly probable cause due to random formation. Complexity is indirectly proportional to random probability, thus the more complex a structure becomes, and the more probable it is that an intelligent creator had to be its origin. What is the Evolutionist’s belief about the origin of cells? Evolutionists presume that random occurrences sequentially organized the right molecules to formulate ‘data’ in the proper sequence to make the DNA code that exists in all living organisms. Putting this in perspective, a literal comparison is the belief that randomly writing down letters on paper, or typing in letters on a keyboard will eventually result in a perfectly polished, best-selling novel that not only makes sense and is in a legible language, but will be able perform highly precise mechanical functions. How much info is in a human cell? The probability of random numbers creating a complex structure like a living cell becomes a statistical impossibility. We are talking about randomly putting letters together to write billions of books that are all perfectly organized – only a divine intelligent designer can account for complexity with such high precision. You can think of Genes like the words in a book or a computer program, when combined, they create a description of some part of a living organism. These genes encode all the information, than proteins and cells use this information as a blueprint or references to begin making biological structures. An organized structure of the DNA containing nucleotide sequences, genes & regulatory elements combine with proteins that control its functions. The bio-chemical structure made of multiple amino acids; typically that performs some bio-mechanical function. The sequence of the amino acids in the protein is defined by the sequence of a gene in the genetic code. Nucleic acid containing genetic instructions used to develop and create the functions of all living organisms. 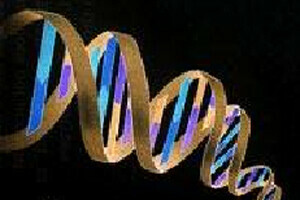 DNA sequences carry genetic information, i.e. genes, have structural purposes, and are involved in regulating the genetic information. The molecular unit of hereditary, a specified section of the DNA strand. I.e. the words (or code) in the DNA to make proteins, which are needed to develop and control its functions. Molecules that create the structural units of DNA when joined together. Chromosomes are the most complex molecular structure known in the entire universe. There is no time in human history to have a better understanding of how information is programmed into a complex structure then in today’s world. 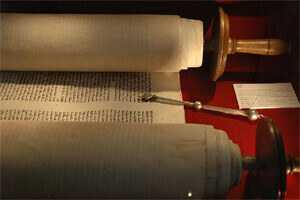 Information used to be distributed and processed only through written language, in ancient scrolls and books, but now in today’s world we have computers. We can all understand that if every letter is not placed in its proper sequential order, the ‘information’ is not going to be understood or even usable (by the person reading it). If we where going to write down a list of commands; not only does every word need to be legible but the words need to be in the proper order from beginning to end in order to achieve the desired goal. Words are written on a piece of parchment giving a list of information and/or instructions that is revealed to the reader. This information has to be understandable, meaning that a pre-determined language has to be mutually understood by both parties. Inside computers, data bits are transmitted and received by millions of transistors within a processor that properly sequence the information to operate different peripherals. Every program must be written so it can be interpreted by the entire system in order to function properly, or else the data will not work. T he most advanced form of encoding information is chemical sequencing. DNA – Using 4 different Nucleotides, a genetic sequence is programmed to create the DNA code, this DNA code is used to build some part of the organism it is written for. It has to be programmed correctly as any deviation in the code results in defects to that part of the organism. What would it take to ‘evolve’ the first genetic code sequence based on random variation? We understand that in order to get an evolutionary change, the ‘programming’ of the code must change through random variations in the proper sequence and in the proper arrangement to get a new functioning biological system. Now the question is, where does that new part of a genetic code come from, and how can it create a ‘beneficial’ evolutionary advancement? Specifically, if we observe an already existing genetic code; there are only 4 natural ways that random changes could be made to the code. 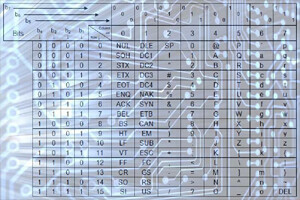 Meaning that part of the information that already exists gets scrambled making a random sequence of that information. A gene or chromosome gets duplicated twice and now you have two pieces of the same information. Nothing is, or can be produced except words from the letters that are already available. Evolutionary expectations to make random changes in the genetic code will only produce scrambled information, causing deficient, non-working codes that will destroy or cripple the organism. Now we can understand that even though there are genetic alterations, we are never changing the genetic code from anything that isn’t already in it. Except in rare cases that information is getting introduced into the code by geneticists. Genetic engineering proves intelligent design because in order for a highly skilled intellectual geneticist to make a proper genetic change, they have to tediously find the code or gene they want to introduce and manually orchestrate the entire process. An organism’s Genetic information is passed down to its offspring. 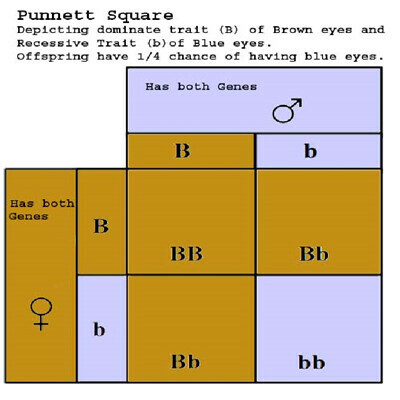 Punnett squares depicts the dominant and recessive genes that will be used in the creation of the organisms offspring to determine its biological features. This will also determine what genetic information will be available not only for the constructing of their offspring while it is forming in the womb; but will also determine what genetic information their offspring will have available in order to pass on to the next generation. In this example, if both parents had the dominant and recessive genes for both brown and blue colored eyes, only 1/4 of their children will have blue eyes (as blue is the recessive gene.) and the rest (3/4) will have brown eyes, 2/3 of those with brown eyes will continue to carry both types of genes, and only ¼ will lose the blue eye gene entirely. 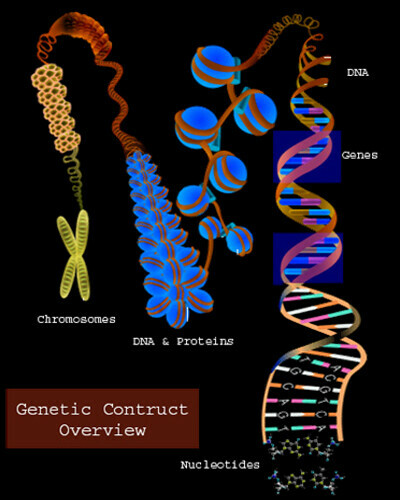 Breeding out the dominant or recessive genes from any organism does not mean that any sort of macro-evolution has occurred; rather it is just another proof of the genetic code variations already programmed by the creator, it is an example of micro-evolution (pre-programmed genetic variations within one kind of organism). Scientists have calculated that a couple would have to have approx 102017 children before having 2 that are identical (same eyes, color skin, curly hair etc. ), that’s 10 with 2017 zeros after it! This shows that genetic recombination that happens between parents proves genetic codes were designed and pre-programmed to create new variation within each generation for various purposes. Genetic homology is the comparison of different sets of genetic codes within between different species, and making comparisons with the presumption that they had a common ancestor. Evolutionists have long believed that genetics would reveal truth behind macro-evolution, and it has, it shows it never happened. Research shows that humans are typically 99.9% genetically similar to each other, meaning that roughly 99.9% of our genetic code is identical to every other person. Evolutionists take these similarities to mean we have a common ancestor, but it should be better interpreted as we all have a common Designer. Our Designer would have known we need to have a similar DNA structures as our food, or we wouldn’t be able to eat it. Plants that had significantly less structural DNA then us would probably not only look quite alien, and provide no nutritional value, or be very toxic. And if our Creator made humans in this fashion, he would have to make all other animals similar genetically to be able to eat the food in the world He created. The Bible acknowledges the similarities between humans and animals, that what happens to one affects the other. This similarity shows a common Creator and His purpose to keep a balanced ecosystem in the world. If the creatures of the world where too different, either genetically or in some other fashion, they would not be able to interact or use the same sources of food! God wants us to know His common designs are so we can relate to other creatures in the world, but at the same time know we are created with a much higher purpose. I said in my heart, It is because of the sons of men, that God may prove them, and that they may see that they themselves are but as beasts. Evolutionists have yet to devise a working model of ‘evolutionary advancement.’ It was assumed that the more complex and ‘evolutionary advanced’ organisms should have more chromosomes or genetic sequences, but this model fails. If amphibians evolved before mammals, why do some amphibians have 5 times more DNA than mammals? Amoebas where supposed to be one of the first evolutionary steps in the process of the development of every living organism, yet some amoebas have 1000 times more DNA then other more advanced living organisms ( Scientific American, October 2004, p. 62)! If macro-evolution did occur, shouldn’t there be some sort of pattern of procession when comparing advancements in organisms to the number of chromosomes or genetic sequences? Wouldn’t it seem logic that something as “simple” as penicillin would have evolved first since it has so few chromosomes or a smaller amount of genetic information? Yet the evidence is contrary to what the theory of evolution would suggest. Are humans and Chimps genetically similar? Recent studies by evolutionists seem to have been inflating their finding of similarities between human and chimpanzee DNA to a supposed 96%. 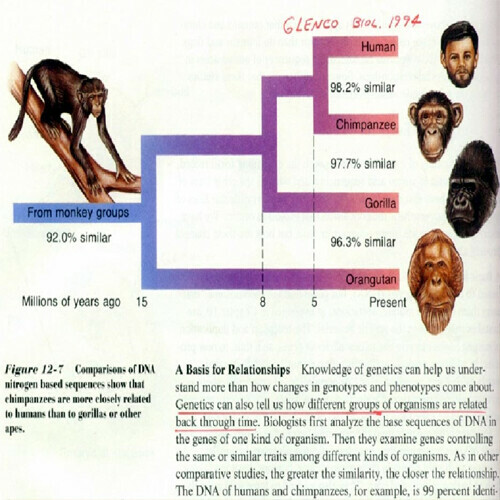 Reports in 2007 show that when the data reflects the DNA sequence gaps in alignment are allowed to be revealed, over 23% of the human genome shares no ancestry with chimpanzees. Using 40k chimp DNA sequences, 1600 DNA alignments where generated using specified parameters obtaining a genome-wide sequence of 89% in similarities between humans and chimps. Then, to increase capacity for sequence matching, the number of alignments was widened to 5500; they found at best 85% similarities in DNA between humans and chimpanzees. To understand the dilemma, we first have to ask the question, just how much of the code are they actually looking at when they make these comparisons and statements? The result is only based on about one million DNA bases out of the three billion (1/3,000) which make up the human and chimp genomes, says Britten. “It’s just a glance,” he says. Non-coding DNA describes a sequence in an organisms DNA that does not encode for proteins. In most multi-cellular organisms a large portion of its DNA is considered non-coding DNA, although that portion does vary between kinds of animals, but it was believed around 90-98% of all DNA was ‘junk’. The evolutionist looks at this data and interpreted it as evidence of evolution as finding ‘leftover’ information existing from previously evolved species transitions. Even though many of these sequences don’t have a known biological function, there are still many features to them that are not yet even understood. Although these sequences have been identified as “junk,” geneticists are finding out more and more that these sequences are absolutely necessary for an organism to live. Experiments are beginning to show that it is not junk but rather neutral DNA. Geneticists have found many of the ‘junk’ sequences are actually yielding newly recognized genes, finding that they acts as regulatory switching functions that turn on/off other specific genes. Pseudo genes and mRNA have been found to regulate gene expressions. Other studies have found that specific ‘junk’ DNA regions are used to block transcriptions of adjacent genes. Interesting enough in the end we still find NO evidence of ANY ancient species DNA left in our genome! Finding in the research the differences were equally split between “junk” regions that do not have any genes, and gene-rich parts of the genome, suggesting they may be evenly distributed. Britten thinks it will be some time before we know what it is about our genes that makes us so different from chimps. He thinks the real secrets could lie in “regulatory” regions of DNA that control whole networks of genes. “It’ll be a while before we understand them,” he says. Very surprising to evolutionists where the results of a project conducted by ENCODE. It found out of 23 different mammalian species, 50% of each of their non-coding ‘junk’ DNA was not conserved (not similar), and 40% had no known function. Evolutionists believe all mammals had a common ancestor but this experiment continues to verify they do not; in fact the non-coding DNA experiments retain evidence that different kinds of mammals have no correlation or link to each other through any previous common ancestor. Genetic DNA – Thomas, B. Study Demonstrates Complex Cells Could Not Evolve from Bacteria. ICR News. Posted on icr.org October 8, 2010, accessed December 29, 2010. Thomas, B. 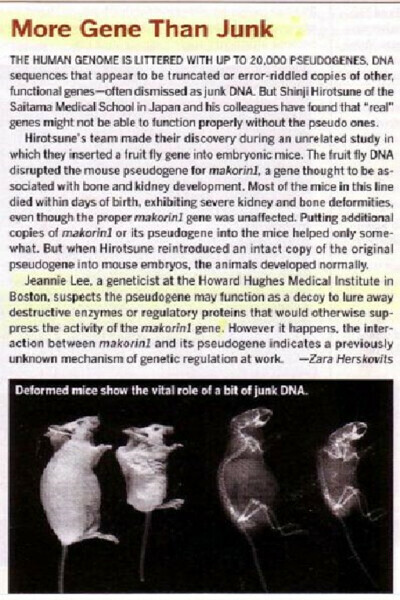 Another Setback for ‘Junk’ DNA. ICR News. Posted on icr.org October 18, 2010, accessed December 29, 2010. Thomas, B. ‘False’ Gene Discovery Confirms Creation Prediction. ICR News. Posted on icr.org July 12, 2010, accessed December 29, 2010.